My absolute favorite holiday is almost upon us! Don't we all need a day where the only requirements are to feast, and be thankful, and to love on our families? Well, okay, I did forget to mention that somebody's got to be responsible for cooking the feast! 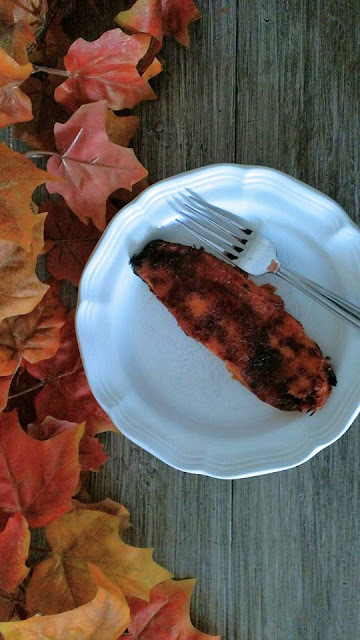 If you'll be the one cooking this year's Thanksgiving meal...or if you are just looking for a great side dish for any day...I've got an old fashioned mountain recipe that will make all true sweet potato lovers swoon! Sweet potatoes have traditionally been a popular food throughout Appalachia. They keep fairly well if stored properly throughout the winter, and it doesn't hurt that they're pretty tasty too! They certainly were a common sight on my family's table when I was growing up! Some years my mamaw and papaw raised so many sweet potatoes on their Eastern Kentucky farm that Mamaw would store them in boxes in the upstairs rooms of their house. So I found myself on a few trips to Mamaw's house sharing the bedroom with sweet taters! 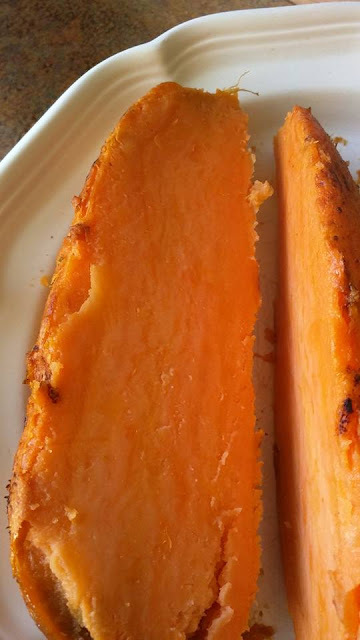 I apparently come from a long line of sweet potato die-hards...as this sweet potato dish I'm going to share with you is an heirloom recipe (tweaked slightly) that was passed down to my mother by her grandmother (my Great Granny E.) decades ago in Eastern Kentucky. 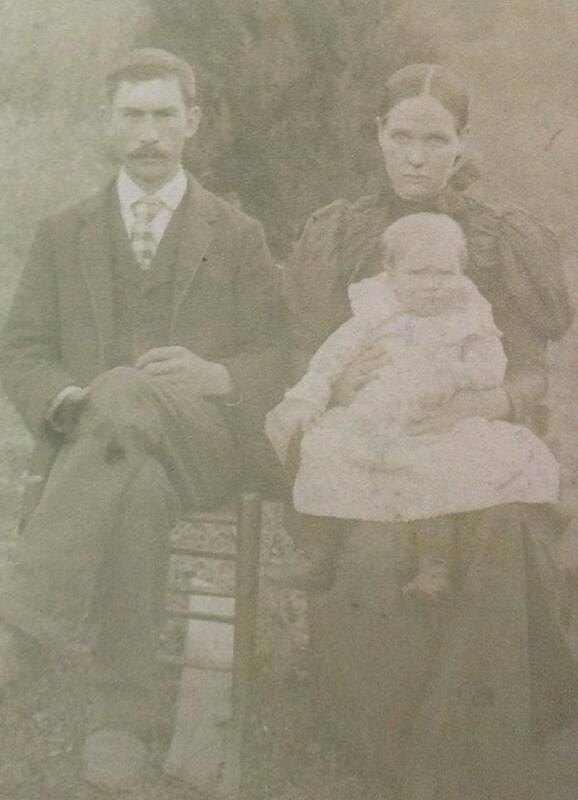 When my mother was growing up, Great Granny E. lived with my mother's family. 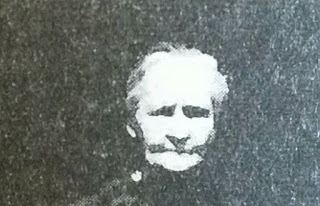 Great Granny E.'s daughter was my mamaw, and Mamaw cared for Great Granny E. when she became too frail to live on her own. So my mother had a glorious opportunity to glean a lot of old fashioned mountain wisdom and know-how from Great Granny E., including some killer old timey kitchen skills! 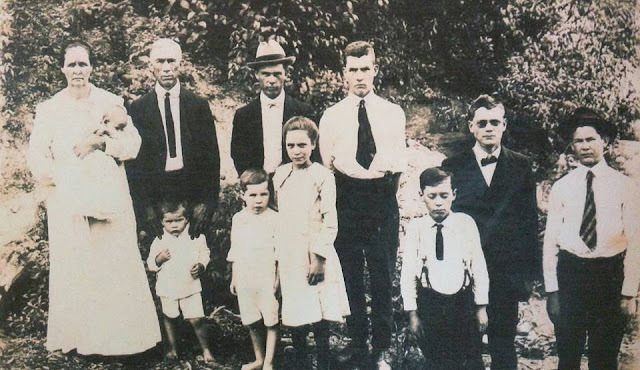 Great Granny E. raised 9 children in the hills of Kentucky...and 8 of them were boys, so you can imagine that she knew a thing or two about feeding people. You all know how boys like to eat! Great Granny E (far left) with my great grandpa and their 9 children. Mamaw is the lone girl in the middle. Bless her heart! With that many mouths, she sure had to be an expert at not letting things go to waste, and this recipe was likely a product of her ingenious frugality. Great Granny E. with my great grandpa and their oldest son. 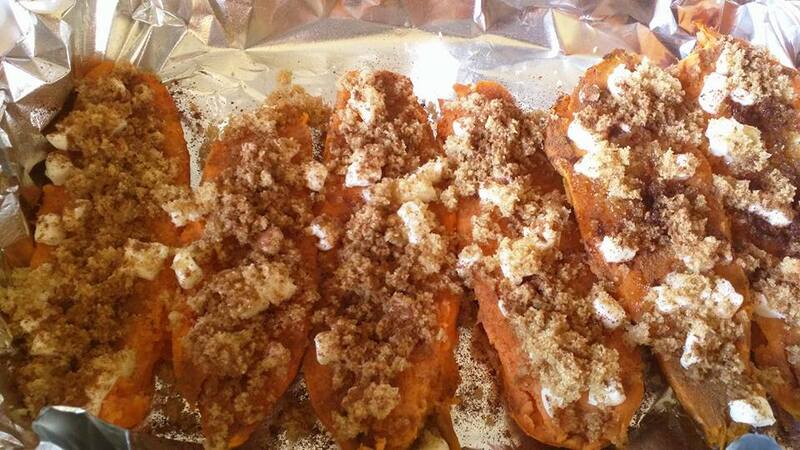 But don't let that fool you...this dish isn't just your run of the mill leftover sweet potatoes. 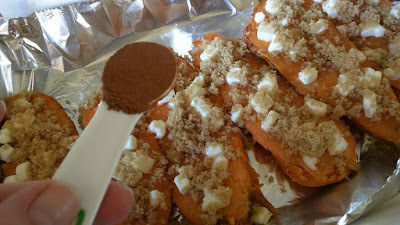 This is a "let's roast some sweet potatoes just so we have some left to make this dish" type of recipe! It's that good, folks....simple, but oh so good! 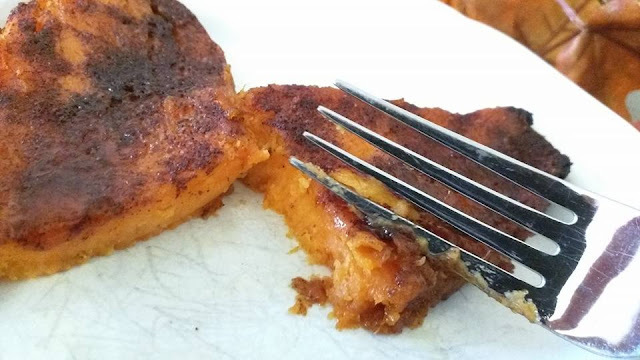 When Great Granny E. made this dish, she started by boiling her sweet potatoes whole, and in the skins, in a pot on an old cook stove. 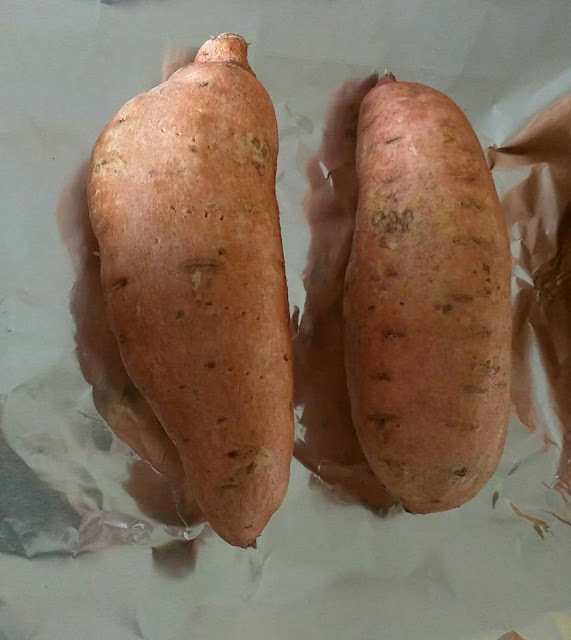 You can start with boiling the potatoes first like her, or go the route my mother takes with the recipe and bake your sweet potatoes in the oven first. Personally, I'd rather bake something than boil it any day...so that's how I made the recipe. So bake 2 large whole, unpeeled sweet potatoes on a sheet pan in the oven at about 425 degrees for around an hour, or until soft. 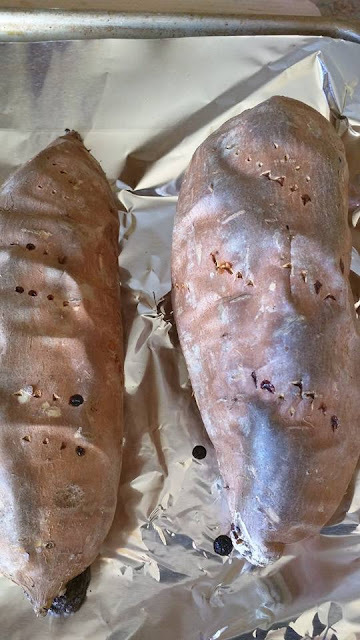 Don't forget to pierce the potatoes with a fork a few times before baking. And if you would like easy cleanup, you can cover your pan with foil first. When the potatoes are tender, remove from the oven and allow to cool. If you will be making this dish right away, carefully peel away the skins once cooled. 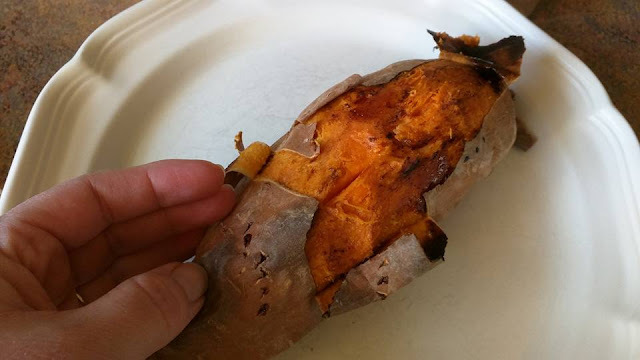 If you will be making the dish much later, or even the next day, refrigerate the baked sweet potatoes in their skins until ready to use. Then remove them from the fridge and peel right before completing the recipe. I love how you can do half the prep of this recipe in advance....that helps to make it a pretty Thanksgiving friendly sort of dish! And you can easily double, or even triple, the recipe for a crowd! So, when your potatoes are cooled and you are ready to complete the final dish...carefully peel away the skins while the potatoes are still whole. 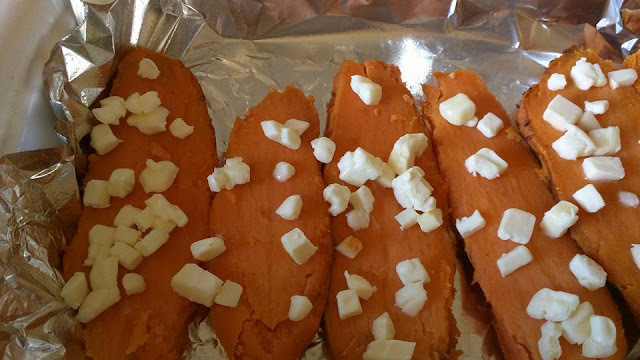 Once peeled, slice each potato in half lengthwise with a knife (or better yet, slice in quarters lengthwise...so they will brown really well) and lay cut side up in a greased or sprayed foil covered baking dish. Next, dot the tops of the sweet potatoes with butter. 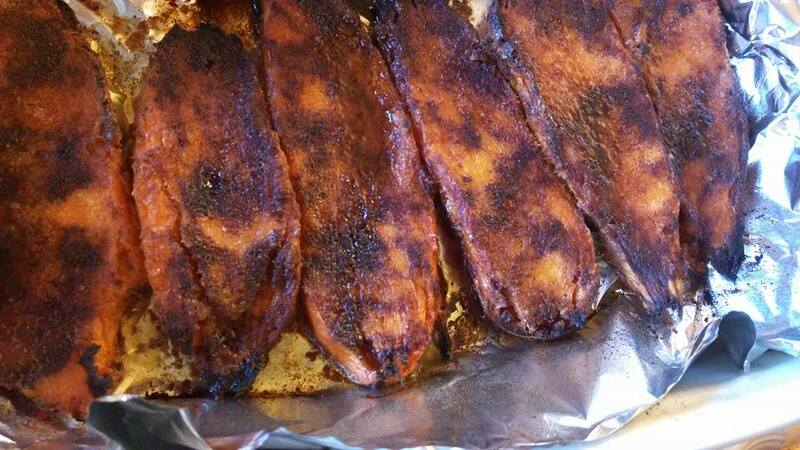 Then follow that up with a layer of brown sugar. Finally, give a generous sprinkling of cinnamon. 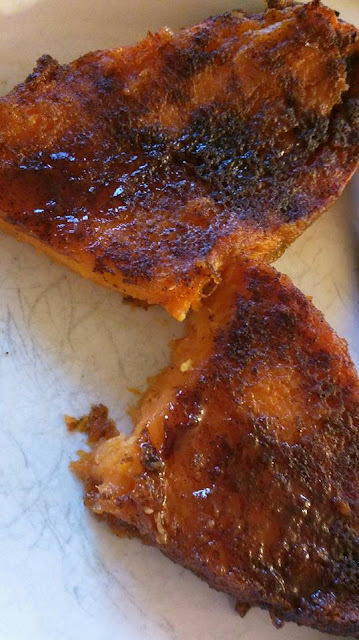 Yes, caramelized to perfection...you can't go wrong with that! The edges of the sweet potatoes will have a slight chewy crispness to them...contrasting beautifully with the tender creaminess of the insides. And did I mention the caramelization? Great Granny E. knew what she was doing by cooking these potatoes twice...it brings out the best in them. Drool worthy!! The full recipe is listed at the end of this post and a printable version can be found here. My prayer is that you have a truly blessed Thanksgiving, surrounded by loved ones and gratitude. And may your table be filled with delicious reminders of your Appalachian heritage, sparking fond memories of the mountains and thankfulness in your heart. God bless! Preheat oven to 425 degrees. 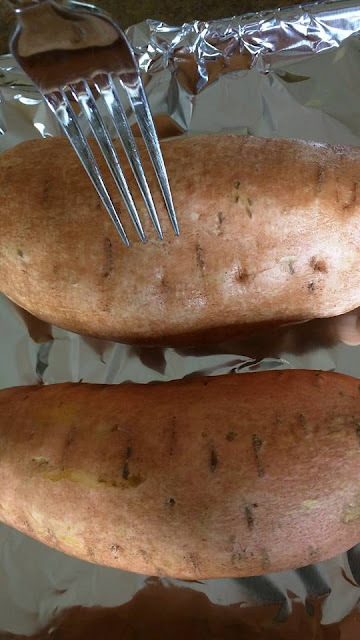 Clean the potatoes and pierce several times each with a fork. 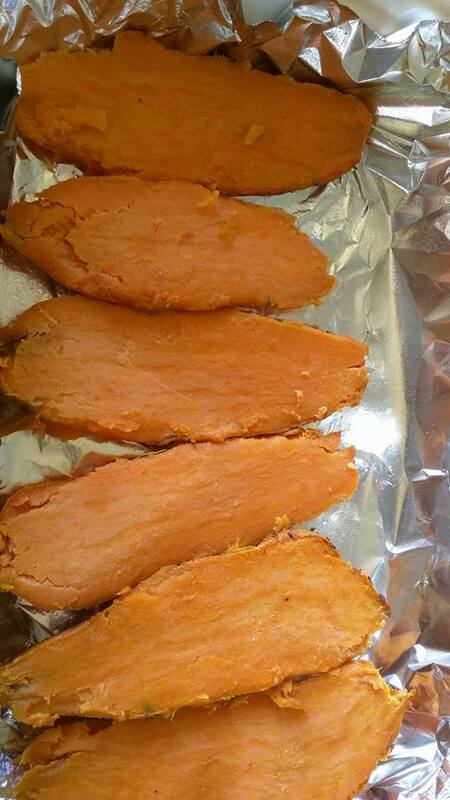 Place on a foil covered baking pan and roast for about an hour, or until soft. 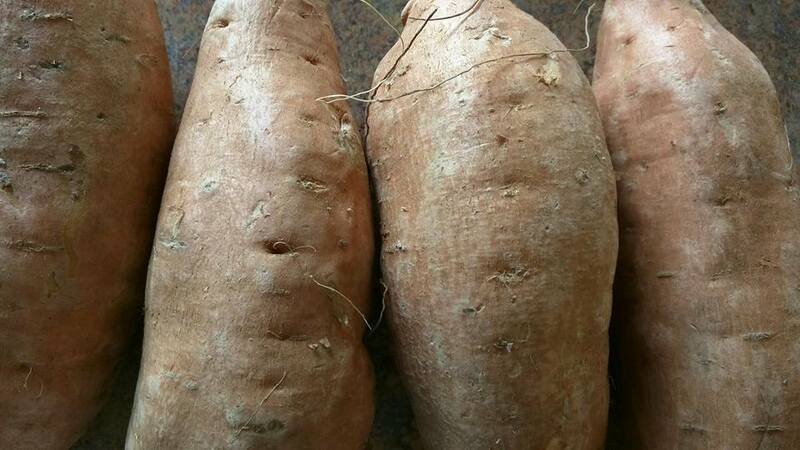 Allow to cool and refrigerate until the next day, or use right away after the potatoes have cooled down. When ready to use, preheat the oven to 400 degrees and carefully peel the potatoes while whole. Then slice each potato lengthwise in half or in quarters depending on thickness desired. 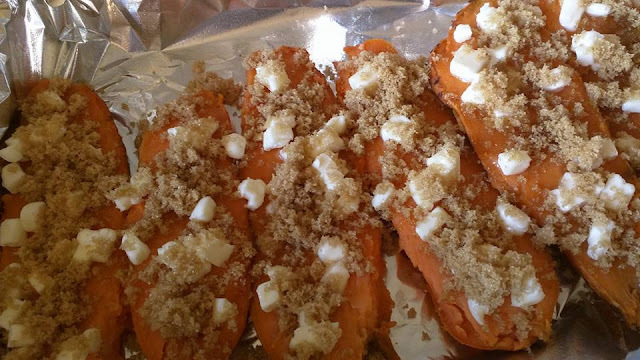 Place in a greased or sprayed, foil lined baking dish, cut sides up. Dot evenly with butter, then sprinkle with brown sugar and cinnamon. Roast for 40-45 minutes, or until edges are nicely browned. 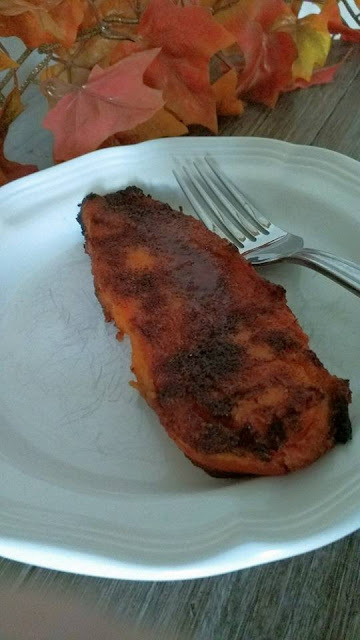 You dish is looking yummy you present and describe this in an attractive way. I will try this too.you made this post good. Keep it up!